Back to a book that really is old (1914), was apparently at least something of a bestseller, and is pretty much forgotten. This is Cleek of Scotland Yard, by T. W. Hanshew. Hanshew was an American, born in 1857 in Brooklyn, but he lived in the UK from 1892. He died in 1914. He was an actor, playing when very young with the famous Ellen Terry, but he became a writer, and a very prolific writer of early pulp fiction. Wikipedia claims he wrote some 150 novels, many as by Charlotte May Kingsley. His wife, Mary E. Hanshew, was also an author, and they apparently collaborated while he was alive, and further books and stories were published under his name or both their names for some years after his death -- they may have been finished by his wife, or written entirely by her with his name included on the byline for better sales or for some other reason. There is some evidence that their daughter, Hazel Phillips Hanshew, also an author, may have written some later books published under her parents' names, including some of the later Cleek stories. Hanshew was well enough known in his life for his prolificity that he was identified -- apparently wrongly -- as the author of the "Dora Thorne" stories as by "Bertha Clay" -- I found an extract from a New York Times article that appeared shortly after his death claiming to have disproved this assertion. I should add, by the way, that the most useful source for this information was the Science Fiction Encyclopedia, despite that Hanshew was at the best only marginally a writer of fantastika -- Cleek has a mild "superpower", the ability to change his looks by mental effort (supposedly, rather absurdly, because his mother played with a rubber toy while he was in the womb). This is not the first time the SFE has proved the best source of online information about a non-SF author -- it is a thoroughly wonderful resource. Cleek was by far Hanshew's most famous character. The first Cleek book was The Man of the Forty Faces (1910), a fixup of a number of short stories. The book at hand, Cleek of Scotland Yard, reads like another fixup: it's a set of separate crime-solving episodes, linked to some extent by an encompassing plot arc. The SFE says it was published over a number of issues of Cassell's Saturday Journal as "Cleek of the Yard" in 1912 (and, I suspect, 1913, based on my edition's copyright dates: 1912, 1913, 1914). The book appeared, then, in 1914. My copy is from Doubleday and Page. Update: Jess Nevins and (I presume) John Grant have pointed me to references to the Cleek films -- there were quite a few, from 1911 to 1914, all shorts, based on single episodes, presumably from both books. Not surprisingly, Cleek turns up -- he wasn't in the house after all -- but Margot escapes. The rest of the book is a series of mysteries that Cleek solves, usually by leaping to far-fetched conclusions that are invariably correct. Cleek also occasionally uses his mysterious power to disguise himself. He is also often on the run from the Mauravanian Count Waldemar, who wants revenge for Cleek having fouled up some scheme in the past. The mysteries really are mostly a bit absurd, though sometimes amusing. Some of the weapons are curious -- I liked the secret of the projectile used to shoot someone with curare (mainly I suppose because I figured out what it was immediately). In a couple of cases Cleek realizes that no crime was actually committed. Narkom, his constant companion, is something of a buffoonish foil, though not completely so. As noted, it reads mostly like a fixup of separate stories, but there is enough connecting material, and something of an overarching story arc, to consider it ultimately a novel, if a bit of a broken backed mess. One issue is that we see little and learn little of Ailsa Lorne, so that Cleek's relationship with her does not affect the reader at all. I would rank it as one of the less impressive examples of "old bestsellerdom" that I've encountered. Apologies this week, because this book was certainly not a bestseller, and also cannot be called forgotten. But I'm a bit behind on the next "Old Bestseller" I wanted to cover, so I beg your indulgence while I cover one of my favorite books of recent years. Robinson came to my attention with the 2005 novel Gilead, or more precisely, with an excerpt from Gilead published in the New Yorker. I loved the novel, which is about a Congregationalist pastor in Iowa in the 1950s. At the time her only other novel was Housekeeping, written about a quarter century before Gilead. It had also been very well received in literary circles, though I don't think it got quite the attention (or sales) that Gilead received. (After all Gilead won the Pulitzer Prize.) Since then Robinson has written two more novels, both set contemporaneously with Gilead and covering the same events from a different perspective. Home (2008) is an incredibly powerful novel, and Lila is coming out this October -- I can only hope it is as good as Gilead and Home. In many ways Gilead is a novel about fathers and sons. So it is convenient to describe Housekeeping as a novel about mothers and daughters. (And indeed Home turned out to be, to a great extent, about a father and a daughter.) And to a considerable extent this is true, though as with Gilead, any simplistic description sheerly fails to capture any idea of what the book is like. Still, it is true that it is told from the point of view of a woman whose mother committed suicide, and who, along with her younger sister, was after that raised by first her grandmother, then two rather dotty great-aunts, and finally her mother's somewhat odd sister. But in no way does that describe the effect of this quite lovely book. The novel is set in Fingerbone, Idaho, an isolated town on the shores of a mountain lake. Ruth, or Ruthie, is the narrator. She and her sister Lucille spend the bulk of their childhood in the house their grandfather built after coming, almost on a whim, to Fingerbone. Their grandfather worked on the railroad until his spectacular death in a derailment. There were three daughters. One became a missionary, and the other two married quite unsuitably -- neither marriage seeming to last long. Ruthie and Lucille live with their mother for a few years in Seattle, after their father, who seems unknown to everyone, abandons them, and then their mother takes a borrowed car to Fingerbone, drops the girls off at her mother's house, and drives the car into the lake. There follows a few years with their matter of fact and sensible grandmother, a few months with the rather comical great aunts, then the arrival of Sophie, their aunt, who was married about as unsuitably as their mother, and probably for a much shorter time. Apparently she has become a hobo, or in Robinson's term a transient, riding the rails in the Upper Northwest. The bulk of the novel concerns Ruthie and Lucille's life with Sophie, and how they are affected by Sophie's "housekeeping", or lack thereof. The two girls, for a long time close only to each other, react differently to Sophie's ways, leading to a quite unexpected resolution. Indeed the novel surprises everywhere. It is not ever what the reader expects -- it is always original. This extends to the prose, which is as lovely and elegant and firm as that of Gilead, though in a somewhat different voice. If I was to nitpick I would say that I had a firmer sense that the first person narrative in Gilead represented the narrator's voice, while in Housekeeping I think it is more the author's voice than Ruthie's. But quite a lovely voice -- the prose is simply wonderful. Best perhaps to offer longish quote: "Imagine a Carthage sown with salt, and all the sowers gone, and the seeds lain however long in the earth, till there rose finally in vegetable profusion leaves and trees of rime and brine. What flowering would there be in such a garden? Light would force each salt calyx to open in prisms, and to fruit heavily with bright globes of water -- peaches and grapes are little more than that, and where the world was salt where would be greater need of slaking. For need can blossom into all the compensations it requires. To crave and to have are as like as a thing and its shadow. For when does a berry break upon the tongue as sweetly as when one longs to taste it, and when is the taste refracted into so many hues and savors of ripeness and earth, and when do our senses know any thing so utterly as when we lack it? And here again is a foreshadowing -- the world will be made whole. For to wish for a hand upon one's hair is all but to feel it. So whatever we may lose, very craving gives it back to us again. Though we dream and hardly know it, longing, like an angel, fosters us, smooths our hair, and brings us wild strawberries." Housekeeping is a remarkable novel. The spare cold Western landscape is central. Everywhere there is solitude, abandonment. Everywhere houses are lost, not kept. It is quite strikingly moving, and as I said quite unexpected at every turn. As I said it is one of my favorite novels I've read in the past decade -- and Home is another, a great great novel. This week I'm going back into my archive of reviews of older books for a book that doesn't quite fit the parameters of this series -- it's old, and it was probably a bestseller or nearly one, but it was published in France, by a man named France. In fact, Anatole France (1844-1924) was a major figure in French letters (no, not THOSE French letters! ), a member of the Académie Française, and winner of the Nobel Prize for Literature in 1921. His best known novel might be Le Crime de Sylvestre Bonnard (1881). Other well known novels include Thaïs (1890), which was the source material for the Jules Massenet opera, and the book at hand, La Rotisserie de la Reine Pedauque. It is my sense that his reputation has declined somewhat in the past century or so, though I'm not sure -- perhaps in France he is still highly regarded. The Queen Pedauque was first published in 1892 as La Rotisserie de la Reine Pedauque. My edition is a tatty 1926 Modern Library edition, translated by Jos. A. V. Stritzko, with an introduction by James Branch Cabell. There was a sequel of sorts, The Opinions of Jerome Coignard. It's the story of a young man in the late 1700s, Jacques Menetrier, the son of a cookshop owner (the cookshop is called "The Queen Pedauque), who falls under the sway of a somewhat rascally cleric named Jerome Coignard. Coignard freeloads at the cookshop for a while, teaching young Jacques Latin and other things. After a while they are jointly hired by a dotty nobleman, M. d'Asterac, who employs them translating some ancient documents. D'Asterac believes in alchemy, and to that end also employs a Jewish man named Mosaide, who claims to be a 135 year old Kabbalist. D'Asterac furthermore is constantly propounding his theories of "salamanders" and "sylphs", spirits of fire who will come if called, and who are the only worthy lovers. When he has Jacques call a salamander, Mosaide's beautiful niece shows up by coincidence, and soon becomes Jacques' lover. Before long, Jacques is in further trouble, as his one-time object of devotion, the lacemaker Catherine who (it is hinted) was previously Jacques' father's lover, tries to lure Jacques into a relationship, embroiling him in rivalry with a nobleman and with the merchant who is keeping Catherine. The plot is resolved when the merchant breaks in upon a wild party involving the nobleman, Jacques, Coignard and Catherine. At the same time Mosaide, who hates Christians, becomes convinced that Coignard has compromised his niece's virtue (which the book hints might be the case, although it is Jacques and later Jacques' noble rival who actually commit the acts that Mosaide directly lays at Coignard's door). All flee, and by mischance Catherine ends up on her way to Canada, Coignard ends up dead, and Mosaide's niece throws over Jacques for the nobleman, who after all can offer her a lot more in the way of material possessions. Jacques ends up a bookshop owner. Rafael Sabatini (1875-1950) had an interesting life. He was born in Italy to two opera singers, an Englishwoman (Anna Trafford) and an Italian (Vincenzo Sabatini). They were apparently not married when Rafael was born, which is reflected in the parentage of the protagonist of Scaramouche, though they may have married later (Anna referred to herself as Mrs. Sabatini, and the couple stayed together). Sabatini was raised mostly in England with Anna's parents while Anna and Vincenzo travelled, but after the couple settled down as singing teachers in Portugal, he moved back with them, and was schooled in Portugal and later Switzerland. At 17 he took a commercial job in Liverpool, and shortly thereafter began to write stories. though he was fluent in at least six languages, he wrote in English, he said, because "all the best stories are in English". Sabatini lived in many places, but his eventual permanent home was on the English/Welsh borderland. Sabatini's earliest stories are apparently lost, perhaps having appeared in local newspapers, but by the late '90s he was appearing in major magazines such as Pearson's. His novels started appearing in 1902, but his first major success was with Scaramouche, which appeared when he was 46. After its success, many of his earlier novels were reprinted, hence the bestselling status, years after first publication, of The Sea Hawk and Mistress Wilding. Captain Blood, perhaps his second most famous novel, followed quickly on Scaramouche in 1922: it was a fixup of several short stories (and the two subsequent Captain Blood books were overtly story collections). Sabatini complained somewhat about some of those reissues on the grounds that his earlier work was not nearly as good as Scaramouche, partly, he confessed, because "At the time of writing them, I had yet to make the discovery that, to produce an historical romance of any value, it is necessary first to engage in researches so exhaustive as to qualify one to write a history of the epoch in which the romance is set." Sabatini's personal life was somewhat sad -- his only son died in 1927 in a car accident, and he and his wife divorced in 1931. He remarried, and his stepson died crashing his plane shortly after joining the RAF. The first line of Scaramouche is one of the most famous in literature: "He was born with the gift of laughter and a sense that the world was mad." It does slow down a bit after that, for the first few chapters, before gaining momentum. The main character is called André-Louis Moreau, an illegitimate child raised by a country gentleman who calls himself the boy's godfather or uncle -- tongues wag, of course, though we are told that honest and bluff Quintin de Kercadious, Lord of Gavrillac (in Brittany), always denied to his ward that he was the boy's father. André-Louis becomes a lawyer, and rather a cynic, in particular fond of mocking his best friend Philippe de Vilmorin's revolutionary views. But when Philippe is goaded into a duel by the odious Marquis de la Tour d'Azyr, after the latter ordered the shooting of a poacher on his property, André-Louis vows take up his friend's cause, largely because that will annoy the Marquis -- and perhaps also because the Marquis is courting Andre-Louis's cousin Aline, and he is disgusted that she seems ready to sell herself for a title. Soon André-Louis is fomenting revolution in the provincial towns of Rennes and Nantes, and he becomes a wanted man. Aline urges him to flee, and he does, meeting up with a traveling band of players in the tradition of the improvisatory Italian Commedia Dell'Arte. It is about at this point that the novel takes off. André-Louis is beguiled by the beautiful lead actress of the troupe, Mlle. Climène Binet, and he volunteers to join them as property-man and carpenter -- and also to use his knowledge of the classical theater to help the leader, M. Binet (Climène's father), in preparing scenarios. Before long André (as he now calls himself, surname Louis -- a pretty transparent alias) has taken on the traditional trickster role of Scaramouche, and he has completely reformed the troupe, making them a remarkable success with his new scenarios and his acting. And he has also become engaged to Climène. But when Climène agrees to become the mistress of a nobleman -- no other than the Marquis de la Tour D'Azyr -- André is enraged and foments a riot, hoping the crowd will punish him. His acting career over, he proceeds to Paris, now awash in revolutionary sentiment. André apprentices himself to a fencer, and soon becomes pretty much the greatest swordsman in the history of the world, inventing new techniques that will later become standard textbook fare. He tries to ignore the political torrents swirling about him, but he is drawn into things when the aristocrats -- led, naturally, by the Marquis de la Tour d'Azyr -- begin baiting leading men of the more democratic party into duels. It's really great fun: there's no way around that. It's nicely written, funny when it needs to be, and stirring when it needs to be. There's a love story (or two or more), none of which fully convince (mainly because the story is so focused on the men that we never really get to know the women well enough). The main drawback is the way André-Louis is so perfect -- suddenly a great orator, then a great actor (not to mention a budding playwright who it seems would have rivaled Molière had he stayed with it), then the greatest fencer of all time, then a significant politician (though to be fair not really a leader in this area). This stuff is fun, but perhaps just a bit too much. Still, I really enjoyed it, and it's easy to see why it was so popular. 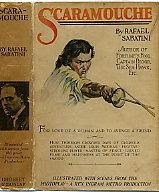 Sabatini wrote a sequel, Scaramouche the King-Maker, published in 1931. It was not well-received. The 1952 movie version of Scaramouche, which starred Stewart Granger, Eleanor Parker, Janet Leigh, and Mel Ferrer (big enough names, anyway), seems to be popular but in synopsis it looks to have played way too fast and loose with the plot and the motivations of the novel. The climactic swordfight is famous as one of the longest in movie history.